This post is long overdue, but by now, many of you know our latest EP titled "Basement Trash" is available wherever you listen or buy music digitally, as well as on cassette at our live shows. Basement Trash was recorded in 2016 and features two all new tracks, as well as two re-recorded versions of some past favorites. Take a listen and let us know what you think! New single "Savannah" available now! The big news is here! Today we're excited to announce the release of a brand new song, and a new EP coming this October. "Basement Trash" is a 4 song EP, consisting of 4 songs--two new, two old. All songs were recorded in Summer 2016. To pre-order, and to hear the first single "Savannah" check out our bandcamp page! Haven't posted in a while, but we've been busy nonetheless! We recently posted several shows for this fall and are currently booking for the rest of the year. In bigger news, we have an announcement coming soon that we're really excited to share. That will be coming out within the next couple weeks so keep an ear out! Sometimes it may seem quiet on the Johnny Mainstream front, but fear not--the gears are always turning. We're working on a special new recording that we're hoping to have out Summer/Fall of this year. We're also playing a couple shows coming up with some awesome bands: April 9th at 750 Main in Willimantic CT, and April 23rd at Cafe Nine in New Haven--a venue that's quietly becoming our home-away-from-home in the southern part of Cee-Tee. On top of this, we're working on several new songs each week at rehearsal, and have been playing some new tunes recently. Onward and upward! See y'all out there! "Foxholes" from Fall Fest 7 now available! Check out our performance of "Foxholes" from Fall Fest 7! Jingle, Jingle, an Award! Let's Mingle! Just a handful of weeks back we played My Rural Radio's Fall Fest 7 in Southern, PA and were awarded the annual Artist Of The Year award by the radio station! We were blown away and just wanted to say thank you to everyone who listens to us on My Rural Radio and be sure to continue to listen at MyRuralRadio.com. One week from today on December 9th we will be returning to one of our favorite jam out spots, Café Nine in New Haven, CT, opening for The Yawpers (TheYawpers.com) from Colorado. Make sure to check these guys, and the show out! Three weeks from today on December 23rd we will be playing our 7th Annual Christmas Eve Eve show with our good friends The Lost Royals at our favorite hometown spot, Grady Tavern. If you've been to one of these in the last six years then you know what to expect, wink wink. One final note, we are currently planning a four song recording session via reel to reel which we plan to put out on cassette very soon. We're gonna take this winter by the horns and barrel through the snow! There's been no venue outside of Manchester that has shown Johnny Mainstream as much support as The Space. Steve Rodgers has put together three incredible venues in Hamden CT and we're happy to be playing the Outer Space on Thursday August 27th with some other great bands. Come see some great music, support the venue, and throw some money their way so they can keep the doors to the Space open and continue serving local artists in Connecticut. Thanks to all the great people who came out on Friday as we released Break the Kettles and Sink the Ship. Thanks to Grady Tavern for having us, and a big thanks to two of our favorite local acts Dr. Martino and Orders. If you don't know these guys, check them out immediately. They both have killer new releases. The show moves on though. Up next we're playing with Beach Slang, Hurry, and Dear Pines at the Space on July 23rd. More info available at ManicProductions.org . Get your tickets in advance, and we hope to see you there. Break the Kettles and Sink the Ship, available TODAY! The day has arrived! Break the Kettles and Sink the Ship is available. Head over to wherever you purchase music: iTunes, Amazon, our Bandcamp, etc. and pick it up. It's been a labor of love over the past year writing, recording, and releasing it. We hope to see lots of new and familiar faces in less than three weeks at Grady Tavern on July 10 when we formally celebrate the release. Tomorrow all the hard work pays off. Break the Kettles and Sink the Ship will be available. Get on that! Let us know what you think! We can't wait!!! Album Release Party July 10 at Grady Tavern! The time has come! Come help us celebrate the release of Break the Kettles and Sink the Ship at Grady Tavern on Friday July 10. We'll be joined by our good friends in Dr. Martino and Orders. This will be your first chance to get your hands on a copy of Break the Kettles and Sink the Ship and we can't wait for you to hear it. Music starts at 9 PM. Excitement starts now. Up until June 23rd, you can still preorder Break the Kettles from our bandcamp page. And remember, every Bandcamp preorder not only gives you a physical copy of the disc, but a personalized, handwritten lyrics book from Matt. By now you know we're releasing our new record "Break the Kettles and Sink the Ship" on June 23rd. But, did you know that if you pre-order the record on Bandcamp, Matt will personally write you a lyrics book by hand (I've seen the first one, and its super cool)? You do now. So get on that! 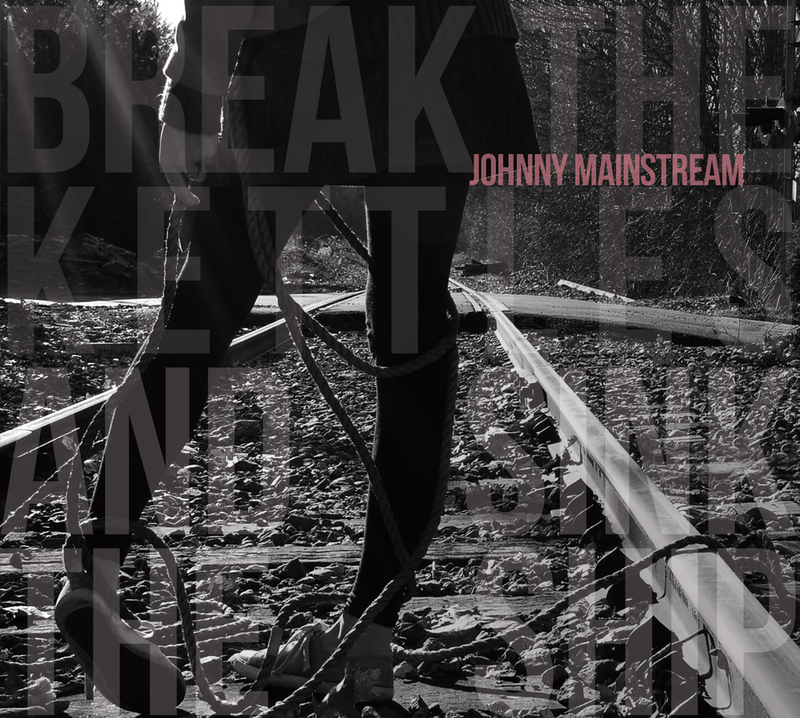 Visit Johnny Mainstream on Bandcamp and order today. We're ecstatic to finally bring to you the first track off our upcoming EP "Break the Kettles and Sink the Ship." Head over to Lonesome Noise to hear the world premiere of "Audrey Horne." Thanks to Chip McCabe at Lonesome Noise for the support (be sure to explore the rest of the site for more great local CT music stuff). We hope you like the song and we can't wait for you to hear more when the album becomes available on June 23. The best way to follow us is by liking us on Facebook where we'll be sharing more songs, videos, and news about the release over the coming months. Onto Mastering! Oh, and a Show this Friday! Moving right along on progress on our new EP "Break the Kettles and Sink the Ship!" Tracking and mixing is all done, and we've sent the tracks to Los Angeles to be mastered. Spirits are high in Camp Mainstream for sure. Stay tuned for news about release dates, etc. Lots of things in the works for this EP. We cannot wait for you all to hear how this record sounds. In the words of JP from Grandma's Boy, "People will bow to it!" This Friday, April 17th we have our first show in our hometown of Manchester CT since Christmas Eve Eve with Dangerous Animals and Analog Sunset at the Main Pub. Be sure to come out and listen to some new music by some awesome original acts. Happy to report we've completed tracking instruments and vocals on Break the Kettles and Sink the Ship. We're onto mixing and we've already received some killer versions from producer Ed. Things are moving along nicely. We're exploring some fun stuff now--distribution, and even new t-shirt designs! Things are looking up. More to come in a few weeks. Check out the shows page for some cool shows playing with Elison Jackson, and also touring act Dylan Jane! Check out the shows page for a few new items. Playing a super cool house show with our friends in Hanging Hills (Stop what you're doing and listen to their new record "The Great Divide" now. Great writing, performing, and production on it). Also added a hometown show at Grady Tavern, with Dylan Jane. For those of you who were able to attend Fall Fest 2014, you may have seen Dylan there as a performer. Happy to welcome her this far north. Very talented act--absolutely worth the visit to ole Grady Tavern. More announcements coming soon, and stay tuned for news about our upcoming release "Break the Kettles and Sink the Ship"
Thanks for a great 2014. Looking forward to '15. A quick note of thanks to everyone who came to our shows, purchased our albums, streamed our songs and wore our t shirts in 2014. We ended 2014 with one of the best shows we've ever played on Christmas Eve Eve and we can't thank you enough to making it so memorable. See ya in 2015. New music, new shows, new haircuts. New show added at Cafe Nine! Happy to announce a new show at Cafe Nine with Eurisko and Mercy Choir. If you had the chance to check out Eurisko at the Main Pub a few weeks back, we don't need to tell you how great they are. Looking forward to returning to Cafe Nine and meeting Mercy Choir. When I was a kid, and I asked my mom to buy me something, she always had the same canned remark, regardless of the month: 'Christmas is coming' (which was another way of saying 'no'). I'll call on th same remark with one edit--Christmas EVE EVE is coming! We've had the privilege of playing this show at Grady Tavern for the last several years. It's one of our favorite shows of the year--small, intimate, and a great chance to see some friends we don't get to see that often. Heck, we like it so much, we even wrote a song about it. More details to come in the weeks ahead. Unlike Wal-Mart, we don't want to rush the season.